Came across this site called the Khan Academy. Apparently this guy - Salman Khan (for those with a Bollywood background - it is not him) - that has taken upon himself to record and publish educational videos about every topic on earth. Thankfully he is starting with K-12 subjects and already has almost 14,000 videos published on Youtube. What's more, all his videos are released under a Creative Commons license. A tendency to incorrectly find or ignore patterns in natural or random phenomena. Michael calls it “Patternicity”. A tendency to infuse patterns with a causation agency, often invisible beings from top down. Michael calls it “Agenticity”. With these two ideas, Michael attempts to explain the need for the unexplained - Conspiracy theories, souls, spirits, ghosts and God. While you may not agree with either the precept or his interpretation, you cannot ignore the idea of linking the brain's evolution to the need for our own belief system. This is a post about how mother nature tried to photocopy my car. At least that is what I think it is. Consider the first picture on the left - at the bottom are three receipts I had left in the car, clipped under the visor, while I waited for my shirts from the laundry. They were normal when I left them, but when I reached to pull them out three days later, what I saw surprised me. I got this darkened mess, that clearly reproduces the child seat warning message from the inside of the visor. Quick background. 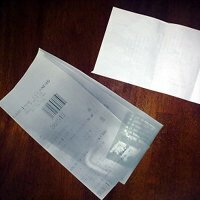 The receipts are generally printed on what is called a 'thermal paper'. 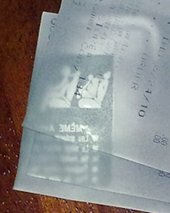 A thermal paper works by darkening in response to applied heat above a particular threshold. For example, you could cause the paper to darken if you left it in a car under direct sunlight for an extended period. However, I do not think that is the reason for the darkening. Consider the following - firstly, I parked my car at work in a covered parking structure for the entire time. Secondly a closer examination of the darkening shows that it was not the gradual darkening of a car left in sunlight. Instead it was hot enough and short enough to cause the darker printed portions of the visor to visibly absorb more heat than the whiter parts of the visor. Finally, there was an electrostatic discharge event (aka thunder storm) during the period with the receipts under the visor that landed close enough to blow out the garage opener, about 10 feet away. Which brings me to my conclusion. The lightning during the night struck close, probably the car itself. This caused a quick but intense heating of the air around. During the dissipation of this heat, the darker parts of the car heated up quicker than the lighter parts resulting in a “natural” photocopy of my car. Swype was a company I had followed ever since I first saw their video describing a new method for text input. Swyping instead of typing. A few days ago, I was able to take advantage of their limited beta for Android mobiles, and install it on my wife's Nexus One. And boy was it good! Here is how it works, instead of typing the letters of a word on a soft mobile keyboard, you swipe a rough pattern through the corresponding letters on a QWERTY keyboard. 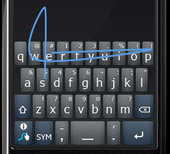 For example, the pattern on the left is tracing the word - Swype. A couple of things stand out - firstly you do not have to be very precise. The tool is very forgiving and can recognize your intent easily. Secondly Swype comes with a 65,000 word dictionary that it adds to every time you type in a word it doesn't recognize. Both key features promise a very easy interface. But how easy to use is it in practice? My wife picked up phone after having Swype enabled on it, and after tracing two words exclaimed excitedly - This is going to change everything. If you knew my wife, that is a sentence she wouldn't normally use for just any app. In addition Swype has a ton of tips and tricks that turn up the speed on mobile text input. The Swype beta for Android mobiles is now closed. Other platforms are not supported yet, but according to the company, support is in the works. The product works. The next challenge for the company is to quickly scale up the platform support - Android, iOS, Symbian and Windows Mobile. And to translate this support into OEM deals like with the T9. This is hilarious. There is a psychic octopus, born in the UK and moved to Germany, that predicts world cup match winners - with amazing accuracy. The question of course is - has anyone with a coin competed with it to see how better the octopus fared against a coin flip. Accompanied with the usual hysteria about long lines, 15 minutes of fame for gadget experts in the mainstream press, and of course the one feature (bug) that is frustrating its users - again. This time around, it is the new antenna for the iPhone. Turns out, the steel casing of the iPhone is a proprietary alloy from Apple, that also functions as the phone's antennas. And if you were to touch it a particular way when you use it, then it doesn't work as efficiently and the phone loses reception. The solution? Avoid holding it that way. The iPhone is not the first phone with reception problems when in contact with the skin. That said, it feels like somehow it is the user's fault for holding it that way. The tone taken by the company has started to sound more and more punk - not the cool kind, but the irresponsible kind. And this is where it has started to piss some of its most ardent fans off. It just adds to my initial feeling about the company - they are no longer as innovative as they once were. Instead they are now touting incremental evolutions as breakthroughs while developing an intolerance for a true challenge to their way of thought. I guess they have a right to it, but it is getting sillier by the minute. After living in the minds of kids, nerds and movie makers for decades, a true practical jet pack has finally emerged. The Martin Jetpack is the world's first usable personal flying vehicle. This is definitely not the first successful jet pack. Earlier attempts like the Bell Rocket Belt, had been successful, but barely usable. The initial version had a flight time of about 20 seconds that increased to 30 seconds through later innovations. The Martin Jetpack achieves almost 30 minutes of flight time. Built from carbon fiber composite, the device has a dry weight of about 250 lbs driven by a 2.0 L V4 2 stroke engine rated at 200 hp (150 kw). The best part - the fuel for the jet pack is premium gasoline. The jetpacks are now available for commercial sale. Some reports have put the price at around $86,000. Not bad if it means you will fly to your next big evening. Listen to the guitar riff and identify the album the song appears on! A little while ago, I was able to get my hands on a signed copy of Andrew Mcafee's Enterprise 2.0. The book starts off talking about the key idea behind the 2.0 tag, introducing the power of "emergence" in social networking. It then goes on to introduce 2.0 technologies, illustrating their impact on businesses through four case studies. A couple of quick frameworks to think about social networking technologies are introduced next, along with the key benefits of the Enterprise 2.0 space. Legal discovery risk - One of the precepts of the book is that moving from a channel of communication (e.g. email) to a platform (e.g. wiki) doesn't necessarily increase discovery risk related to litigation. The support? Andrew did not see any in the large number of businesses that have thus far implemented 2.0 technologies. Put this way, I am sure the argument seems shallow. Emails has been around for the good part of three decades, and only now have they really started to become the target of discovery requests and increasingly part of legal proceedings. Flippant emails form great news headlines, and even if the legal risk was zero, reputation damage would not be inconsequential. There is no reason to think a platform would fare any better. Uncertainty - 2.0 emergence takes time. Social media presumes a flat user base, that is largely unconcerned with direction, that seemingly generates something awesome from thin air. There is too much uncertainty in that vision, uncertainty businesses do not like. Uncertainty of deliverable, time, order, ownership may work well when the stakes are lower. But when having a job is critical to taking care of the kids at home, it is too much to hope jobs stick around long enough for something awesome that may emerge out of uncoordinated actions. Again, I am sure that sounds extreme, but it does illustrate the oxymoron Enterprise 2.0. At the end, the approach that the author lays out for a company to implement 2.0 technologies is tellingly similar to that of a pre-2.0 IT implementation. Identify problem and vision > don't expect dramatic wins > communicate > redesign processes > and measure. I believe, 2.0 technologies are answers to specific questions, as opposed to revolutionary tools just waiting to deliver multi-pronged increases in productivity. It seems more to be a case of 2.0 enabled Enterprise, than Enterprise 2.0. Here is another that shows both players taking the option of going back in time to thwart each others' designs. So much fun! Who doesn't know moot? Christopher Poole, also known as m00t, is the founder of 4chan, an internet board that both anonymous and non-persistent. If you did not know moot or 4chan, you would most certainly have heard of him when the latter decided that the former had to win the title of Time's World's Most Influential Person. They not only rigged the online poll for the winner, but ensured that the first letters of the top 21 read - mARBLE CAKE ALSO THE GAME. Well moot got an opportunity to speak at TED and pitch the case for online anonymity. It was a short speech, with a longish Q&A after. It was a good overview of the pluses and minuses of 4chan and anonymity, but it was also missing a core message that drove the need to limit privacy intrusion online. A fun watch, but maybe a missed opportunity as well. Then I realized that the name of the tool itself was Alpha, not version Alpha of something big that was still come. Then, it was not a search engine at all, but a computation engine. Third, the data for the tool is not assembled by hyper-intelligent programs. Instead it depends teams of individuals to 'curate' data that can then be used by Alpha. What that means is that the extent of Alpha's knowledge base depends entirely on a validated data set provided to it by someone. The coolest part of Alpha, therefore, seemed to be its natural language translation capability. The ability to translate speech into precise mathematical commands against a defined data set. It was still good, but far less impressive than a tool that was going to search the web, separate signal from noise, and perform massive computation against said signal. The reason for the post is two-fold. First, I met folks from Wolfram|Alpha during a corporate event recently. When we started to look at the tool for internal use, I was struck by how the conversation seemed so very similar to the sales people of just another Business Intelligence (BI) tool; not magic whatsoever. Then I saw the the video from TED (after the break), by Steven Wolfram. The talk is of course a pitch for Alpha, Mathematica and A New Kind of Science. But it slowly devolved into a made-up term-fest punctuated by too much I, and use of highly presumptuous language. Like the “co-evolution of users and machine” after the release of Wolfram|Alpha. I guess I am put off from Alpha for the moment. Take a look and see if you agree.